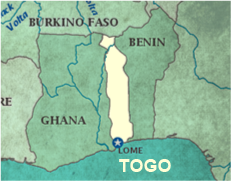 Togo is located in Western Africa sandwiched between Benin on the east and Ghana on the west. Burkina Faso is at its northern boarder. Its coastal boarder in the south is on the Bight of Benin. 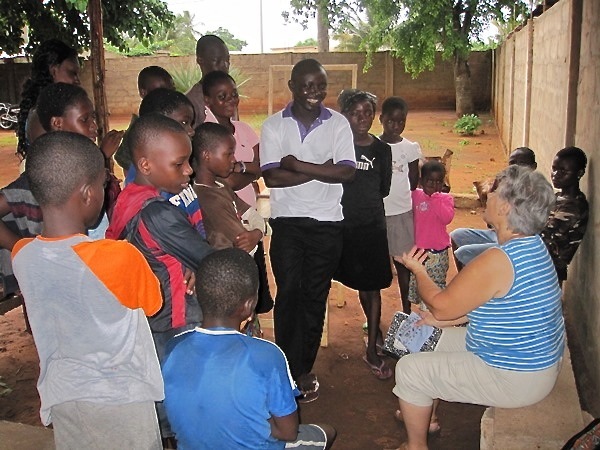 The villages of Togo have many problems which need to be addressed to affect the quality of life. We live and work in the village so that together we can get a clear idea of the most pressing problems and how they can be solved. As a village community we desire to collectively make the following changes in the daily life in the villages of Togo, West Africa. Health is the primary area of concern. In order to achieve any goal the villagers must be physically and mentally capable. Parasites and malnutrition rob the people of the necessary energy to initiate and maintain new development plans. Together we are addressing the health and wellbeing of the villagers medically, through education and changes in the living environment, such as clean water and sanitation systems. Agriculture is their main industry, but poor soil management has deteriorated soil health. Working in cooperation with established organic agriculturalists we work toward sustainable improved soil health, crop production and effective livestock management. Rural development helps to foster management of natural resources and economic growth. We work together to establish or re-establish capacity building to achieve full potential of human resources for the dignity of all individuals and the village collectively. Values passed on from generation to generation have an influence on choices and decisions in life. Together we scrutinize these values to see whether they are life-improving or life-draining. Values can change with time. Education can improve lives and livelihoods. We share knowledge as well as learn from each other. Together we can lay a foundation for their future. Spirituality gives a sense of rootedness and when shared it nurtures community. We share our spiritual faith by living the Catholic values of human dignity, compassion, collaboration, empowerment, integrity, justice and stewardship. The necessary work we do daily can be a learning process which not only fulfills each person's needs but encourages complete development intellectually, physically, and creatively. Economic development is the end product of an improved life because now that the daily focus is no longer surviving there is an atmosphere that encourages discovery and creativity. We encourage villagers to be motivated as thinkers and designers for their future.